Self-care and wellbeing resume as a hot topic, emerging as an all-inclusive trend with expectation to rise in popularity. Whether it's mental or physical wellness, people are choosing soothing interior styles to help release the tension and stresses of busy and demanding lifestyles. Get the black spa-inspired look! Whilst your immediate thoughts may turn to white walls and minimalist décor, there is the consequence of creating an emptiness effect with this conservative style. Choosing a bold colour for your bathroom can vastly improve your mood, and whilst it may seem daunting, selecting a black colour scheme can render feelings of peace and tranquillity! To create a luxurious and sensual ambience for your spa-inspired bathroom, choose black mosaic floor and walls tiles and blend either warm or cool metal hues to the space. Hardware in chrome or polished stainless steel can add a glistening and reflective effect whilst copper, brass and rose gold finishes add a warming glow. Select mirror frames and accessories to match the tone of your chosen metals as this will complement the overall aesthetic. Consider the dramatic change of bathroom colour as a healthy holistic approach to your wellness, for the mind, body and the eyes! Integrating polished stainless steel hardware into your black bathroom, such as modern internal door handles with polished stainless steel levers, will offer a unique and deluxe aesthetic whilst providing elements of sophistication to the space. Made from high quality grade 304 stainless steel, these door handles will ensure longevity and durability. The polished finish of the stainless steel hardware provides the ideal solution for adorning modern style homes and properties. As an alternative to warm and cool metal tones, choose the neutral hue of matte black for your hardware and accessories for a daring all-black bathroom design. 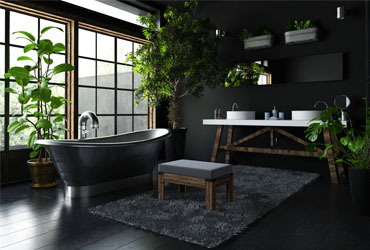 This concept is exceptionally daring yet so simple to incorporate into your styling and with a variety of matte black features will most certainly distinguish the character of your bathroom from the bathrooms of others. We strive to make your interior design planning easier by offering inspiration and a variety of high-quality products that excel in both aesthetic and performance. Try this interior style to help ease some of your tension and stresses.